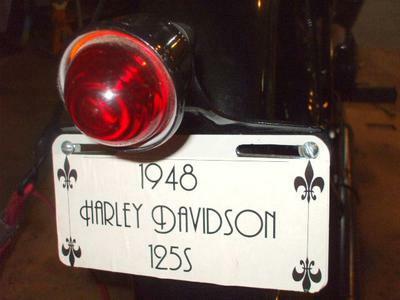 The nice, old 1948 Harley Hummer for sale is a 1948 Harley Davidson 125S that underwent a complete restoration a couple of years ago. I got the vintage motorcycle on a trade and all I know about it is that it has not been cranked since the restoration was completed. It has never even had gas or oil put in it! The battery is new but has not been filled with acid. The motor has a little oil applied to the piston so it turns over good and has good compression. HD Hummers here and then give me a shout! The 125 has all new Firestone tires and new wiring. I am holding a clear Missouri Title in my name. I have noticed that recently the Old 1948 Harley Hummer rolls hard when I push it around the shop but I don't know if the problem is a dragging brake or a dry clutch. 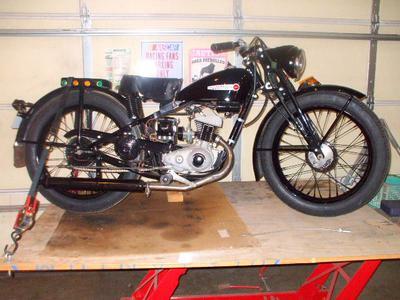 This vintage motorcycle would serve beautifully as a display bike or someone can easily get it running and turn a lot of heads. I have more pictures of the Harley if anyone would like to request them using the form below this classified provided by GoGoCycles Used Motorcycles for Sale. The price on this beautiful HD Hummer 125 is $6,900 and it is in Crane, Mo Missouri USA. Is this HD still for sale?